The 279 pellets that CANU said it found at an East Coast Demerara house, after a woman was arrested at the Cheddi Jagan International Airport. She later excreted 44 pellets. 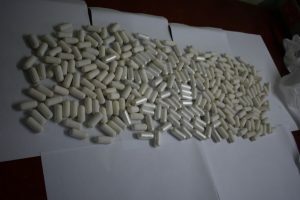 A New York-bound 19-year old woman, who excreted 44 pellets after she was intercepted at Guyana’s Cheddi Jagan International Airport, was among four persons arrested Friday, the Customs Anti-Narcotics Unit (CANU). The law enforcement unit said the woman was an outgoing passenger on Flight BW 526 destined for JFK International Airport. CANU said that interdiction led to an operation at a location on the East Coast of Demerara Friday evening where 279 suspected cocaine filled pellets were seized. Three persons were arrested and two suspects remain at large.